Molecular markers have often been used for taxonomic identification and phylogenetic analyses in different species groups. Evolution of rDNA is relatively independent of changes in morphology, and analyses of these genetic data have been shown to provide good phylogenetic resolution. So, it was decided to perform a phylogenetic analysis on species of the genus Leidynema appendiculata, Hammerschmidtiella indicus and Schwenkiella icemi based on ribosomal DNA (rDNA) sequences. During the present study, a partial fragment of the small subunit ribosomal RNA gene (SSU rRNA) and large subunit ribosomal RNA gene (LSU rRNA) was sequenced for purposes of molecular identification. In the present study, phylogenetic relationships of species of the genus were investigated using nucleotide sequences of the region of 28S rDNA and 18S rDNA. Phylogenetic analyses were performed for primary sequence data as well as using neighbour-joining and maximumparsimony approaches. During the recent past, species description and identification of the nematodes are almost made through morphological studies. However, morphological identifications are sometimes based on very small and minute differences. Systematics and taxonomy of nematodes have changed substantially after introduction of DNA sequencing and genomic studies [1-7]. Recently, molecular markers have often been used for taxonomic identification and phylogenetic analyses in different species groups. The ribosomal RNA gene represents a well conserved gene that evolves relatively slowly. Ribosomal DNA genome sequences are widely used in the evolutionary studies of many different groups of organisms. Ribosomal RNA gene provide the utility of gene order in reconstructing phylogenies, and the differences in base composition and codon usage are currently progressive areas of research using comparative genomics. With the current developments in DNA sequencing it is probable that this will change in the near future and a new opportunity will open to study the effects of life cycle variations and differential selection pressures in reconstructing deeper relationships from molecular data. On the other hand, this study on comparative rDNA genomics, suggests that nematodes represent a good model to study various aspects of genetics and evolution. Evolution of rDNA is relatively independent of changes in morphology, and analyses of these genetic data have been shown to provide good phylogenetic resolution [8,9]. In fact, several recent studies of eukaryotes used rDNA sequences in phylogenetic analyses to make strong inferences of ancestor descendant relationships when analyses of morphological data only resulted in more unanswered questions [10,11]. In addition, the analysis of rDNA nucleotide sequences has recently been used to access phylogenetic relationships among taxa of both higher and lower organisms [11-13]. Conserved regions like 18S, ITS-1, ITS-2 and 28S of ribosomal RNA (rRNA) gene, which are very useful tool for molecular taxonomic studies and for the correct identification for parasites and their phylogenetic studies. All these tools are reliable and may function as aiding kit in the prevailing taxonomical identification processes. The sequences of this gene have recently been used in the studies resolving the phylogenetic relationships between nematode species, and this gene shown to be a suitable marker for barcoding of nematodes. Different studies of nematodes have demonstrated that the 18S and 28S region of nuclear rDNA provide useful genetic markers for the accurate identification of species within the taxa. Choosing the appropriate segment of DNA within the genome of an organism is a critical step in any phylogenetic study [12,14]. The region of choice should have enough variability among the taxa in question to allow an estimation of their historical relationships. This variation must not be too great so as to obscure past ancestor-descendant relationships. The rRNA gene that has been used in molecular systematics is the large subunit rRNA gene (28S) and small subunit rRNA gene (18S). The rRNA gene has been shown to be useful in estimating phylogeny because it contains regions that evolved slowly and other regions evolved more quickly. Thus this gene has been selected to infer divergences used rDNA to examine the evolutionary relationships among animal parasitic nematodes. During the course of study, it was decided to perform a phylogenetic analysis on species of the genus Leidynema appendiculata, Hammerschmidtiella indicus and Sckwenkiella icemi based on ribosomal DNA (rDNA) sequences. During the present study, a partial fragment of the small subunit ribosomal RNA gene (SSU rRNA) and large subunit ribosomal RNA gene (LSU rRNA) was sequenced for purposes of molecular identification. In the present study, phylogenetic relationships of species of the genus were investigated using nucleotide sequences of the region of 28S rDNA and 18S rDNA. The investigator is convinced that the findings of present work will provide a base line for the study of molecular taxonomy of these species and validating their specific status. Review of literature reveals that some taxonomic studies were carried out using molecular tool by foreign workers using either 18S rDNA or 28S rDNA. Nadler et al. studied 18S rDNA contents of T. krausi. Moreover, Koubkova et al. worked out 18S rDNA contents of Thelastoma gueyei. Spiridonov  worked out 28S rDNA and 18S rDNA of Leidynema appendiculata, L. portentosae, Hammerschmidtiella cristata and H. diesingi and more recently, Spiridonov and Guzeeva  studied 28S rDNA contents of Thelastoma sp. Parasites were excised out carefully from alimentary canal of Periplaneta americana from Meerut, UP, India. Parasites were identified up to the level of species morphologically using existing taxonomic keys and descriptions. The parasites found are: Leidynema appendiculata  Chitwood, 1932, Hammerschmidtiella indicus Singh and Malti , Schwenkiella icemi  Basir, 1956. For genomic DNA extraction, one specimen of nematode parasite was fixed in either 95% or 100% Ethanol. DNA was extracted from samples using the Qiagen DNeasy Tissue Kit as per the manufacturer’s instructions. Polymerase chain reaction (PCR) for the amplification of 18S and 28S ribosomal DNA was undertaken using the specifically designed primers. A total volume of 25 μl was used for the PCR reaction. Each reaction contained 10X PCR buffer, 0.4 mM dNTP, 10 pM of each primer pair, 3 μl template DNA, 1 U Taq polymerase (Biotools) and Milli-Q water. The PCR assay was carried out in an Eppendorf Master Cycler Personal for 35 cycles. The amplification profile consisting of 3 min. at 94°C, 30 s at 94°C, 45 s at 56°C and 1 min at 72°C, followed by final extension at 72°C for 10 min. The PCR products were visualized using ethidium bromide on a 1.5% agarose TBE gel. The products were then purified by Chromous PCR cleanup kit (# PCR 10), according to manufacturer’s instructions. Both DNA strands were sequenced using a Big Dye Terminator ver. 3.1 cycle sequencing kit in an ABI 3130 Genetic Analyzer. Same PCR primers were used for sequencing reaction. 18S and 28S rDNA sequence was used to perform the phylogenetic analysis of the sequences. Sequences were uploaded on NCBI to search for the most similar reference sequences and positions of the 18S and 28S gene were determined with the help of BLAST (available at www.ncbi.nlm.nih.gov). Subsequently, nucleotide sequences of various species were aligned using the aligning tool Clustal W . The sequences were entered in the MEGA for construction of the phylogenetic tree. Data were analyzed using maximum parsimony (MP) and neighbor- joining (NJ) methods by using MEGA version 4.0 . Pairwise comparisons were made by using Kimura-2 parameter model . Nucleotide sequences of related sequences and Electropherogram of sequencing sample is also provided in the thesis. The base pair sequence of small and large subunit of ribosomal DNA of parasites submitted to GenBank under the accession numbers: GQ925910, GU968648, GU968649 and GU968647. 28S rDNA sequence of L appendiculata [18,23] was aligned using the clustal W to perform the phylogenetic analysis (Tables 1 and 2; Figures 1-4). The reference sequences used in this study are listed in Table 1. Pairwise comparisons were made shown in Table 2 using Kimura-2 parameter model . The phylogenetic reconstructions inferred from analysis of the 28S rDNA sequences showed great resolution for the species of the nematodes. The Electropherogram of sequencing sample is also provided as shown in Figure 1. Sequence similarity searching for L. appendiculata was performed using the NCBI BLAST program. Analyses of multiple sequence alignments were done with the help of program, Clustal W. DNA sequences of closely related species were also download and used in the phylogenetic analysis. Figure 2: A phylogenetic tree constructed by neighbour-joining method (1,000 bootstraps) for 28S region. Bootstrap values (as percentages) are shown at internal nodes. The scale bar indicates the proportion of sites changing along each branch (the asterisk is used due to same species name). †Species sequenced in the present study. Figure 3: Phylogenetic relationship of the species L. appendiculata inferred from the 28S region using the Maximum Parismony (MP) method (1,000 bootstraps). The scale bar indicates the proportion of sites changing along each branch ( the asterisk is used due to same species name ). †Species sequenced in the present study. 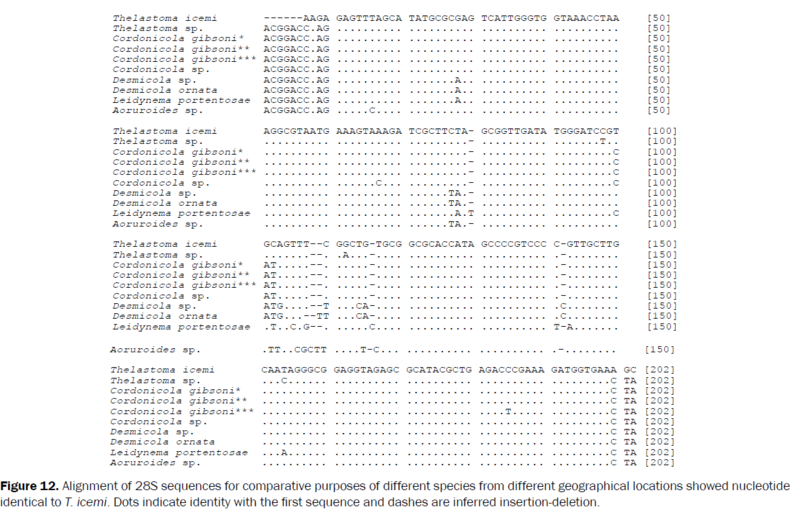 Figure 4: Alignment of 28S sequences for comparative purposes of different species from different geographical locations showed nucleotide identical to L. appendiculata. Dots indicate identity with the first sequence and dashes are inferred insertion-deletion. (the asterisk is used due to same species name †Species sequenced in the present study. †Species sequenced in the present study. Table 1: Reference sequences (28S) used in this study, their geographical origins as well as accession numbers (the asterisk is used due to same species name). Table 2: Kimura 2- parameter distances comparison of sequence differences (in %) in the 28S among species (the asterisk is used due to same species name). The Phylogenetic analysis was performed using MEGA ver. 4.0 . For distance analyses, the Kimura 2-parameter model was used to construct the distance matrix and the trees were inferred from this using the neighbour-joining (NJ) and maximum parsimony (MP) method with a high degree of confidence (Figures 2 and 3). Bootstrap resampling (1,000 pseudoreplicates) was done and a bootstrap consensus tree produced. Both the methods gave trees with similar topology and approximate relatively bootstrapped values. 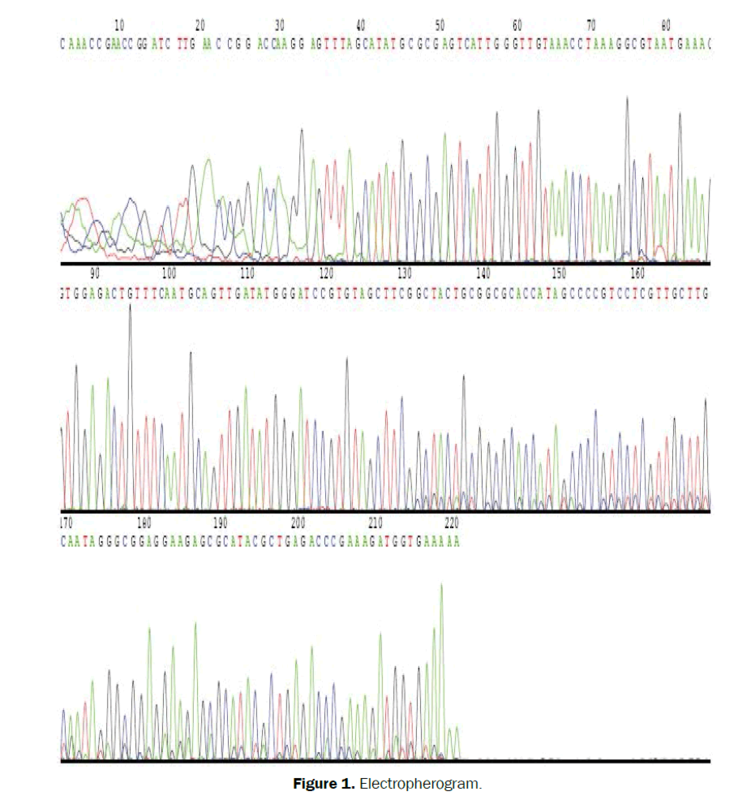 These sequences were aligned with the 28S rDNA genes and revealed clear differences in nucleotide sequences among different species (Figure 4). Different studies have demonstrated that the 28S region of nuclear rDNA provide useful genetic marker for the accurate identification of sibling species and morphospecies. Genetic reltaion between the L. appendiculata and other species based on molecular data from the 28S rDNA gene sequence indicates closest similarity between L. appendiculata from India and L. appendiculata from Russia. Both the species are same and shows 99% nucleotide similarity. The reasons for difference of 1% similarity between them might be due to different continents and geographical distribution. Molecular phylogenetic analysis of ribosomal 28S rDNA indicates its potential for clarifying species boundaries that are morphologically similar and that occur sympatrically. These findings highlight the utility of the 28S sequence in conjunction with other morphological characters to delineate species boundaries among closely related species. The reasons for difference in genetic similarity between these same species from 2 different continents, remains a challenging question for further investigations. Genetic comparison with other species documented from different parts of the world may alter our taxonomical concept of this group/genus and provide further clues to the understanding of the evolution of the L. appendiculata. In conclusion, this work confirms that for modern identification and understanding of this genus, works should be necessarily accompanied with DNA analyses. Besides this, it is also recommended that the criteria to validate and identify species must be based on morphological characteristics, genetic identification and sequence comparison of genes having taxonomic importance. The rDNA (18S) gene sequence was obtained from specimens of H. indicus , 18S sequence aligned using the clustal W  to perform the phylogenetic analysis (Tables 3 and 4; Figures 5 and 6; Supplementary Figures 1 and 2). The reference sequences used in this study are listed in Table 3. Pairwise comparisons of the sequences were made (Table 4) using Kimura-2 parameter model (Kimura). The phylogenetic reconstructions inferred from analysis of the 18S rDNA sequences exhibit significant resolution for this species of the nematode. The Electropherogram of sequencing sample is also provided as shown in Supplementary Figure 1. DNA sequences of closely related species were also download and used in the phylogenetic analysis. Phylogenetic analysis was performed using MEGA ver. 4.0 . Phylogenetic trees were constructed from this using the neighbour-joining (NJ) and maximum parsimony (MP) method with a high degree of confidence (Figures 5 and 6). Bootstrap resampling (1,000 pseudoreplicates) was done and a bootstrap consensus tree produced. Both the methods yielded phylogenetic trees with similar topology and approximate relatively bootstrapped values. These sequences were aligned with the 18S rDNA genes and revealed clear differences in nucleotide sequences among different species in comparison (Figure 2). Figure 5: A phylogenetic tree constructed by neighbour-joining method (1,000 bootstraps) for 18S region. Bootstrap values (as percentages) are shown at internal nodes. The scale bar indicates the proportion of sites changing along each branch. †Species sequenced in the present study. Figure 6: Phylogenetic relationship of the species H. indicus inferred from the 18S region using the Maximum Parismony (MP) method (1,000 bootstraps). The scale bar indicates the proportion of sites changing along each branch. †Species sequenced in the present study. Table 3: Reference sequences (18S) used in this study, their geographical origins as well as accession numbers. Table 4 : Kimura 2- parameter distances comparison of sequence differences (in %) in the 18S among species. Ribosomal DNA sequences are widely used in the evolutionary studies of many different groups of organisms. rDNA provide a closed system within which the mechanisms of genome rearrangement, the utility of gene order in reconstructing phylogenies, and the differences in base composition are currently progressive areas of research using comparative genomics. Ribosomal comparative genomics and phylogenetic reconstruction could allow us to gain insights into several aspects of the rDNA evolution in animals including parasites. Hammerschmidtiella indicus is the first species of this genus to have small ribosomal subunit rRNA gene regions sequenced for the purposes of species discrimination. However, further sequences are required from additional species of the genus Hammerschmidtiella to reveal the position within the nematoda. The position of H. indicus in the phylogenetic trees reconstructed confirms its placement within family Thelastomatidae. Their validity is also strongly supported by molecular evidence inferred from rDNA sequence. The tree topologies derived from the phylogenetic analysis inferred from the 18S rDNA data-set is in agreement that it is closely related sister-taxa genetically viz., L. portentosae, T. icemi and A. tetraptera. Further studies with additional molecular markers are needed to determine the divergence between H. indicus and other nematodes. This study also indicates that molecular markers, such as those provided by rDNA, are useful markers for distinguishing sister-species and is helpful in discriminating species where there is species overlap and co-infection of the same definitive host especially when morphological differences are often difficult to determine. However, nematode molecular phylogenetic studies are still at an early stage. During the course of study analysis of nucleotide sequences of 18S, 28S region of the nuclear ribosomal DNA (rDNA) was made (Tables 5-8 and Figures 7 and 8). The alignment of the sequences with other nematode sequences published in GenBank was done using clustal W . The reference sequences used in this study for 18S are listed in Table 5 and for 28S listed in Table 7. Pairwise comparisons were made by using Kimura-2 parameter model that are shown in Table 6 for 18S and Table 8 for 28S rDNA sequences. The phylogenetic reconstructions inferred from analysis of the 28S rDNA sequences showed great resolution for	this species of the nematode. 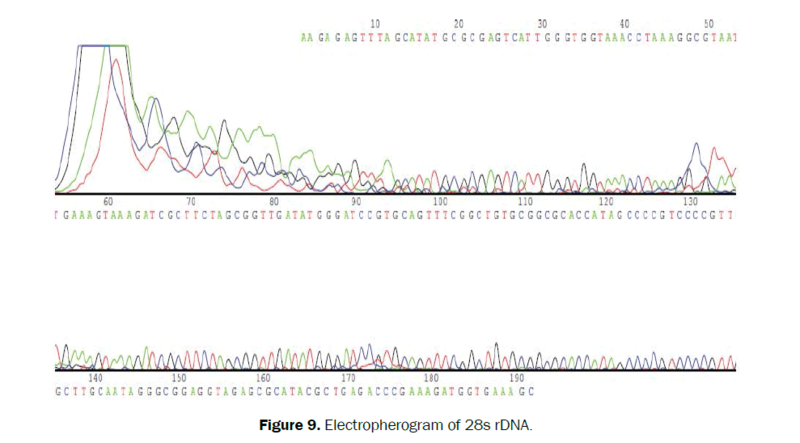 The Electropherogram of sequencing sample is also provided as shown in Supplementary Figure 3 for 18S and Figure 9 for 28S. DNA sequences of closely related species were also download and used in the phylogenetic analysis. Phylogenetic analysis was performed using MEGA ver. 4.0. The sequences appeared to be the most closely related and is much more divergent with a well supported clade by neighbour joining (NJ) and maximum parsimony (MP) with a high degree of confidence (Figures 7 and 8 for 18S; Figures 10 and 11 for 28S; Supplementary Figures 3 and 4). Figure 7: A phylogenetic tree constructed by neighbour-joining method (1,000 bootstraps) for 18S region. Bootstrap values (as percentages) are shown at internal nodes. The scale bar indicates the proportion of sites changing along each branch. †Species sequenced in the present study. Figure 8: Phylogenetic relationship of the species T. icemi inferred from the 18S region using the Maximum Parismony (MP) method (1,000 bootstraps). The scale bar indicates the proportion of sites changing along each branch. †Species sequenced in the present study. Figure 9: PElectropherogram of 28s rDNA. Figure 10: A phylogenetic tree constructed by neighbour-joining method (1,000 bootstraps) for 28S region. Bootstrap values (as percentages) are shown at internal nodes. The scale bar indicates the proportion of sites changing along each branch. †Species sequenced in the present study. Figure 11: Phylogenetic relationship of the species T. icemi inferred from the 28S region using the Maximum Parismony (MP) method (1,000 bootstraps). The scale bar indicates the proportion of sites changing along each branch. †Species sequenced in the present study. Table 5: Reference sequences (18S) used in this study, their geographical origins as well as accession numbers. Table 6: Kimura 2- parameter distances comparison of sequence differences (in %) in the 18S among species. †Species sequenced in the present study. Table 7: Reference sequences (28S) used in this study, their geographical origins as well as accession numbers. Table 8: Kimura 2- parameter distances comparison of sequence differences (in %) in the 28S among species. †Species sequenced in the present study. The asterisk is used due to same species name. Bootstrap values, indicating the robustness of the internal nodes, were set at 1000 replications. Both the methods gave phylogenetic trees with similar topology and approximate relatively bootstrapped values. These sequences were aligned with the 18S and 28S rDNA genes and revealed clear differences in nucleotide sequences among different species shown in Supplementary Figure 4 for 18S and Figure 12 for 28S. Figure 12: Alignment of 28S sequences for comparative purposes of different species from different geographical locations showed nucleotide identical to T. icemi. Dots indicate identity with the first sequence and dashes are inferred insertion-deletion. Several recent studies of nematodes used rDNA sequences in phylogenetic analyses to make strong inferences of ancestor descendant relationships when analyses of morphological data only resulted in more unanswered questions. Therefore, it was decided to perform a phylogenetic analysis on species of the genus Schwenkiella based on ribosomal DNA (rDNA) sequences. Evolution of rDNA is relatively independent of changes in morphology, and analysis of these genetic data has been shown to provide good phylogenetic resolution. The region of choice should have enough variability among the taxa in question to allow an estimation of their historical relationships. This variation must not be too great so as to obscure past ancestor-descendant relationships. rRNA genes that has been used very frequently in molecular systematics is the small and large subunit rRNA gene (18S and 28S). These rRNA genes have been shown to be useful in estimating phylogeny because it contains regions that evolve slowly and other regions that evolve more quickly. During the study, I have used 18S and 28S rDNA to examine the evolutionary relationships among animal parasitic nematode with Schwenkiella icemi . In the present study, phylogenetic relationships of S. icemi  with several other species of the nematodes were investigated using nucleotide sequences of 18S and 28S rDNA. The obtained sequences in this study have been aligned with sequences of other nematodes available in GenBank. Comparing the 18 S sequences through BLAST search, the query-18S sequence was found to be highly similar to the sequence of Hammerschmidtiella indicus (97%), Leidynema portentosae (96%), Paraspidodera sp. (96%), Aspiculuris tetraptera (96%), Thelastoma krausi (95%). Moreover, the BLAST results showed that the query-28S sequence is closely similar to the sequence of Thelastoma sp. (97%), Cordonicola gibsoni (97%). The phylogenetic analysis revealed that the high bootstrap values strongly confirm the position of T. icemi within the family Thelastomatidae (Figures 7, 8, 10 and 11). The results of all the phylogenetic analysis clearly demonstrated that S. icemi represented by a single branch that was clearly distinct from other related nematodes. But the gene bank and molecular biological data recognizes it as Thelastoma icemi rather than S. icemi. Further studies with additional molecular markers are needed to determine the divergence between T. icemi and other Thelastomatids. The authors are thankful to Head, department of Zoology, C.C.S. University, Meerut, for providing laboratory facilities. This work was funded by the Department of Science and Technology (Grant number SR/SO/A543/2005). Aleshin VV, et al. Relationships among nematodes based on the analysis of 18S rRNA gene sequences: molecular evidence for monophyly of chromadorian and secernentian nematodes. Russian Journal of Nematology.1998;6:175-184. De Ley P and Blaxter ML. Systematic position and phylogeny. In: Lee DL (ed.). The Biology of Nematodes.Taylor & Francis, London, UK. 2002;pp:1-30. De Ley P and Blaxter ML. A new systemforNematode: combiningmorphologicalcharacterswith molecular trees, and translatingcladesintoranks and taxa. NamatologyMonographs and Perspectives. 2004;2:633-653. Basir MA.Oxyuroid parasites of Arthropods. A monographic study. 1. Thelastomatidae 2. Oxyuroidae. Zoologica. 1956;38:1-79. Holterman M, et al. Phylum-wide analysis of SSU rDNA reveals deep phylogenetic relationships among nematodes and accelerated evolution toward crown clades. Molecular Biology and Evolution 2006;23:1792-1800. Meldal BHM, et al. An improved molecular phylogeny of the Nematoda with special emphasis on marine taxa. Molecular Phylogeneticsand Evolution. 2007;42:622-636. Zhao ZQ and Buckley TR. Phylogenetic analysis of nematode nuclear 18S rDNA sequences indicates the genus TripylinaBrzeski, (1963) Nematoda: Tripylidae de Man, (1876) should be placed in EnoplidZootaxa. 2009;2238:25-32. Carmean D, et al. 18S rDNAsequences and the Holometabolous insects. Molecular Phylogeneticsand Evolution.1992;1:270-278. Heise PJ, et al. Higher-level snake phylogeny inferred from mitochondrialDNA sequences of 12S rRNA and 16S rRNAgenes. Molecular Biology and Evolution. 1995;12:259-265. Derr JN, et al. Variation and the phylogenetic utility of the largeribosomal subunit of mitochondrial DNA from the insectorder Hymenoptera. Molecular Phylogeneticsand Evolution. 1992;1:136-147. Thompson JD, et al. CLUSTAL W: improving the sensitivity ofprogressive multiple sequence alignment throughsequence weighting, positions-specific gappenalties and weight matrix choice, Nucleic AcidsResearch. 1994;22:4673-4680. Hillis DM and Dixon MT. Ribosomal DNA molecular evolution and phylogenetic inference. Quarterly Review of Biology. 1991;66:410-453. Halanych KM, et al. Evidence from 18S ribosomalDNA that the Lophophorates are protostome animalsScience.1995;267:1641-1643. Nadler S A. Phylogeny of some Ascaridoid nematodes,inferred from comparison of 18S and 28S rRNA sequences.Molecular Phylogeneticsand Evolution. 1992;9:932-944. Koubkova B,et al.A new species of Thelastoma Leidy, 1849 (Nematoda: Thelastomatidae) from the Senegal diplopod Archispirostreptustumuliporus (Diplopoda: Spirostreptidae). Nematology2006;8:739-747. Nadler SA, et al. Molecular phylogeny of clade III nematodes reveals multiple origins of tissue parasitism. Parasitology.2007;134:1421-1442. Spiridonov SE and Guzeeva EA. Phylogeny of nematodes of the superfamily Thelastomatoidea (Oxyurida) inferred from LSU rDNA sequence. Russian Journal of Nematology.2009;17:127-134. Leidy J. Description of some nematoid Entozoa infesting insects. Proceedings of the Academy of Natural Sciences, Philadelphia 1850;5:100-102. Singh HS and Malti. Studies of some nematode parasites of Periplanataamericana Linnaeus at Meerut, Uttar Pradesh, India. Flora and Fauna. 2003;2:59-66. Sidow A and Thomas WK. A molecular evolutionary framework for eukaryotic model organisms. Current biology.1926;4:596-603. Tamura K, et al.MEGA 4: Molecular Evolutionary Genetics Analysis (MEGA) software version 4.0. Molecular Biology and Evolution. 2007;24:1596-1599. Kimura M. A simple method for estimating evolutionary rate of base substitutions through comparative studies of nucleotide sequences. Journal of Molecular Evolution. 1980;16:111-120. Chitwood BG. A synopsis of nematodes parasitic in insects of the family Blattidae. Zeitschriftfu¨rParasitenkunde 1932;5:14-50. Singh HS and Malti. On a known and some unknown species of nematode parasites of Gryllotalpaafricana. Journal of Experimental Zoology, India. 2003;6:329-330. Blaxter ML, et al. A molecular evolutionary framework for the phylumNematoda. Nature1998;392:71-75. Schwenk JM. Fauna parasitologia des blattoides do Brasil. ScienciaMedica.Anno 2014;9:3-16. Spiridonov SE. Phylogeny of the intestinal nematodes of invertebrates 2009.